Transforming felted cabs into fashion accessories - this is part of my continuing journey with my handmade felted cabs. From just abstract cabs, it is time to turn them into cute reflections of nature. 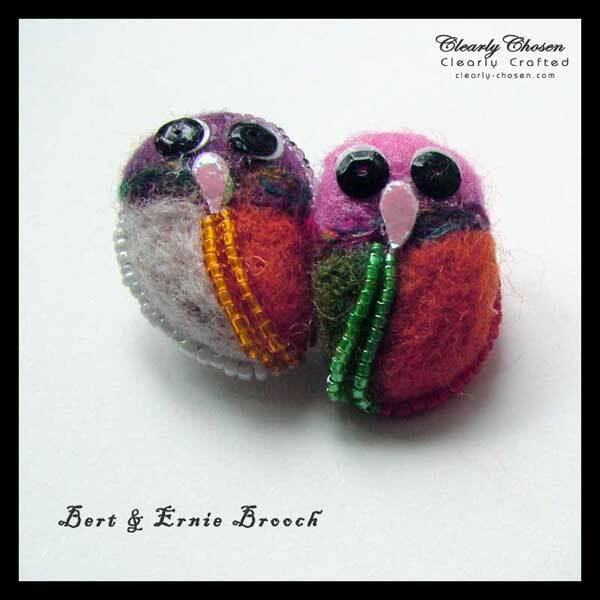 This cute couple here is Bert & Ernie Brooch. Are they gay you may be wondering? You gotta ask them yourself but I reckon they are cute and obviously very happy in each others' company. And that is enough for me. 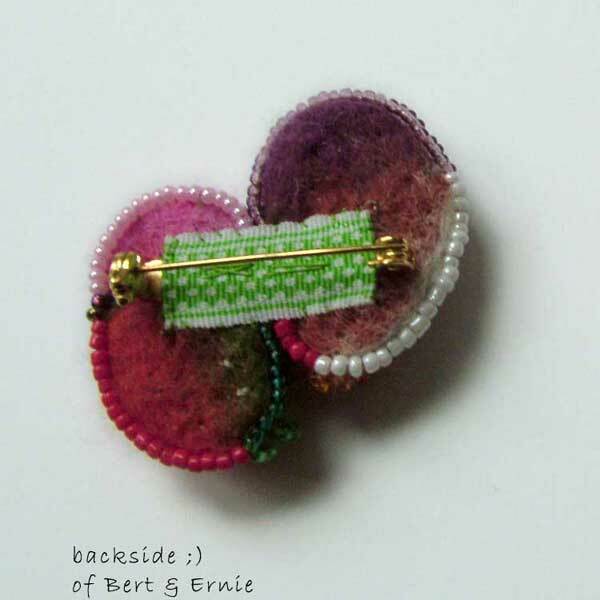 Bert and Ernie Brooch now live with a famously wonderful person in United Kingdom. 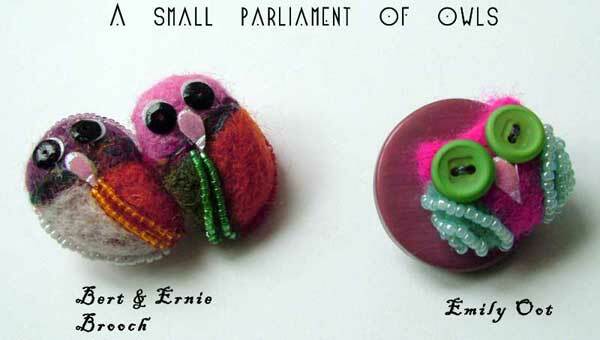 As their surname implies, they be a Brooch together. Just like Emily Oot (who came just shortly before them) Bert & Ernie are not very big. But as proud fashion accessories, they do command a lot of attention and I do confess, they are pretty proud of their looks and intellect. And they respond tremendously well to lots to TLC (tender loving care, in case you are wondering). The reverse side (or should I say "backside"?!!) of Bert & Ernie deliberately sets a tone of, well .. gaiety. I have used a strong, festive ribbon tape over the already attached brooch back. 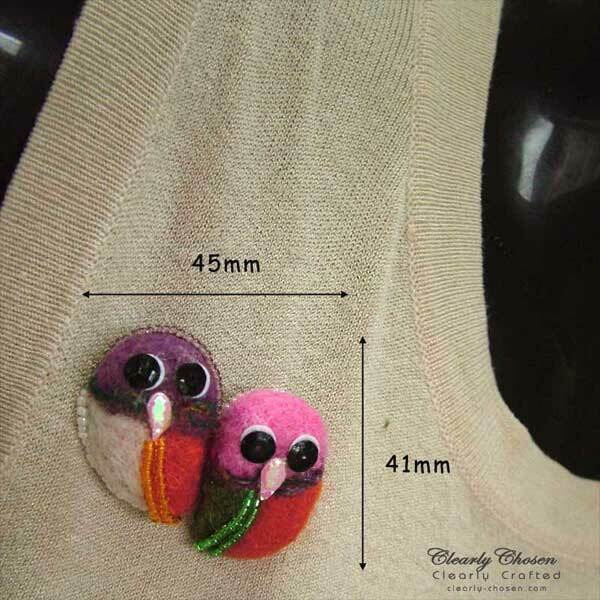 It is both a festive color statement (they are very individual that way) and as a practical means of further reinforcing the brooch pin to the felted cab duo. Bert & Ernie once told me that they consider that ribbon tape as a kind of "bonding band" - a symbol of them being together for many years and being green, viz. that they too will be ever green - together! Where has Bert & Ernie gone? Bert & Ernie brooch are a truly blessed couple. Strutting their stuff as new fashion accessories, they were quickly snapped up by Kerrie Slade in UK. Bert & Ernie were so overjoyed at the news that THEY wanted to take flight and fly there under their own steam. I had to break the news to them that aerodynamics functions were sadly not part of their charms. They took a plane like proper parcels do. Kerrie Slade is a superbly talented and well known jewelry artist. She has numerous awards under her belt and has been published innumerous times in the best Beadwork magazines in the world. And I can tell you from personal contact that Kerrie is one of the most refreshing, adoringly lovely people around. She reports back on Bert & Ernie from time to time. Apparently they are well-behaved. Humph! It must be due to the wonderful, calming influence of Kerrie Slade. I think they are just bewitched by her and her talents. And who can blame them!